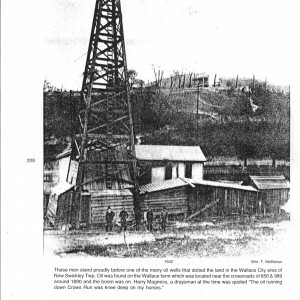 Caption under the picture reads: These men stand proudly before one of the many oil wells that dotted the land in the Wallace City area of New Sewickley Twp. Oil was found on the Wallace farm which was located near the crossroads of 856 & 989 (aka Freedom Crider & Rte 989) around 1890 and the boom was on. Harry Magness, a draysman at the time was quoted “The oil running down Crows Run was knee deep on my horses. New Sewickley Township was created in 1801 when the original Sewickley Township, then two years old, was divided. At that time, New Sewickley Township was situated in the eastern part of Beaver County and was composed of about 19,279 acres of hilly, but very fertile land. The remaining area was called North Sewickley Township. Since then, some thirteen other boroughs and townships have been formed from the original Sewickley Township. The most prominent area in the Township was Unionville, situated where the Zelienople Road (Route 68) crossed Brush Creek. This was a residential area and many businesses thrived there. At one time there were two new car dealerships; a Nash dealer and an Overland dealer. Unionville had two doctors, a cheese factory, several general stores and service stations, a sawmill and a gristmill, a foundry and a wagon and buggy shop. Farmers Building and Loan starter there. Unionville was once a bustling community full of history and fond memories for many of our Township residents. Although Wallace City is only a crossroad today, it was once a booming oil town in the 1800’s. Wallace City took its name from the first oil well drilled on the Robert Wallace farm. It produced 2,600 barrels, the largest production of any well and continued to produce 1,400 barrels per day. Wallace City was made of the usual service buildings, such as boarding houses, blacksmith shops, livery stables and temporary buildings associated with the industry; however, no permanent residences were ever erected. Today, there is nothing visible to remind us of oil wells or Wallace City. The crossroad is still there, but it is paved now, instead of axle deep in mud. The land in the Crow’s Run area was known as Indian lands until March 12, 1783 when it was set aside as part of the depreciation lands awarded to those men who served in the Revolutionary War. Beginning in 1880 and for the next four decades, the Crow’s Run Valley became a bush industrial region for the production of clay, oil, building stone, brick-making and building of railroads. Fine building stone was sent from these quarries to Pittsburgh, Philadelphia and surrounding areas. Some Notable buildings erected from this stone are the Pittsburgh Post Office, the Pennsylvania Railroad Station in Pittsburgh, the First Presbyterian Church in Beaver, the Carnegie Library in 1902, in Beaver Falls and much of the stone used in and about the court house in Beaver. At one time the brickyards employed 350 men. The Township’s skyline is easily recognized from nearly every high point in the county because of Big Knob, a dome-shaped hill nearly 200 feet higher than any of its neighbors. It is recognized as Beaver County’s highest point.